B: Current Operating Mode. Switch between Operating Modes by going to Menu -> Operating Modes. C: Current Product ID Number Entered. You can tap here to enter a number manually or use the “ABC” keyboard to search by title. D: Voice Search. Tap the microphone icon to enter the title or ISBN of an item verbally. E: Cost Of Goods. Tap to enter a preset value of the item’s cost. You can manually input a value by tapping H.
F: Target List Price. 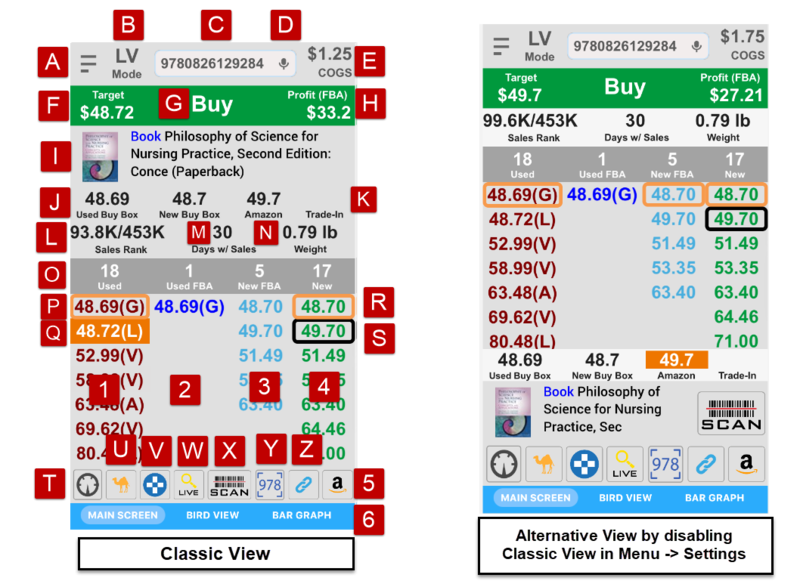 The price that is used to determine the profit as shown next by Letter H.
After you enable hidden mode. When you are doing live searches on a country other than the US. G: ‘Buy’, ‘Reject’, or a custom message for the current item based on either the Basic and Advanced Triggers; or the more powerful NEW Profit Triggers. *Did you know: You can now tap on (G) to display the Trigger Results which will give you an explanation as to why an item was “Buy” or “Reject.” Here is a video. You can disable/enable this message by toggling the switch under Menu -> Settings -> Enable Triggers. H: The profit based on the currently highlighted price (see fig. Q). You can tap on this box to display a detailed breakdown of the profit calculation. I: This is the product image. You can tap the image to go to the Amazon product page for this item. Next to the image is the Product Title and Product Category. J: Amazon or Buybox price. If Amazon sells this item, it will be outlined with a black outline (see fig. S) in the pricing column display. If Amazon does not sell this item, it will be the Buybox price outlined with an orange box (see fig. P). K: Trade-In Value. While in Live Search (LV Mode), you can see the Amazon’s Trade-In Value for this item. L: The first number is the current sales rank, and the second is the average sales rank over the past 12 months. The average sales rank will give you more accurate information on the popularity of this item. The background color will change based on the current sales rank number. O: Display number of FBA, Used, and New offers and prices in each respective column. You can tap ‘FBA,’ ‘Used’ or ‘New’ to go to the corresponding Amazon offers page. If you are on the four column pricing display, you will see Used Price, Used FBA Price, New FBA Price, New Price (Default Setting). P: Used Buy Box Price. Outlined boxes refer to the Used and New Buy Boxes displayed in fig. J.
Q: You can tap on any price to display the profit based on that price in fig. H.
R: New Buy Box Price. Outlined boxes refer to the Used and New Buy Boxes displayed in fig. J. S: Amazon Price. Also shown in fig. J.
T: Dashboard Icon. Allows access to account settings, database, trigger, and menu settings. Click here for more info. W: Tap to perform Live Searches. X: Scan Button. Tap to open camera for scanning. Y: OCR. Allows you to scan ISBN numbers (ex. 9780744011906) without a barcode. Click here for more info. Z: You can tap this to view items in BookFinder, AddAll, BookScouter, Google(UPC), eBay (Sold) or Google(Title). *For UPC numbers, you need to do a live search in order to check on those sites. *To use eBay (Title), eBay (Sold), or Google (Title), you need to do a live search to get the item’s full title. 2: Used FBA Pricing Column. 3: New FBA Pricing Column. 5: Check Restriction. Tap on the Amazon Icon to see if you can list this item for sale on Amazon. Click here for more info. 6: Alternative screen layouts. Swipe the screen left or right to change to other screens. Click here for more info. 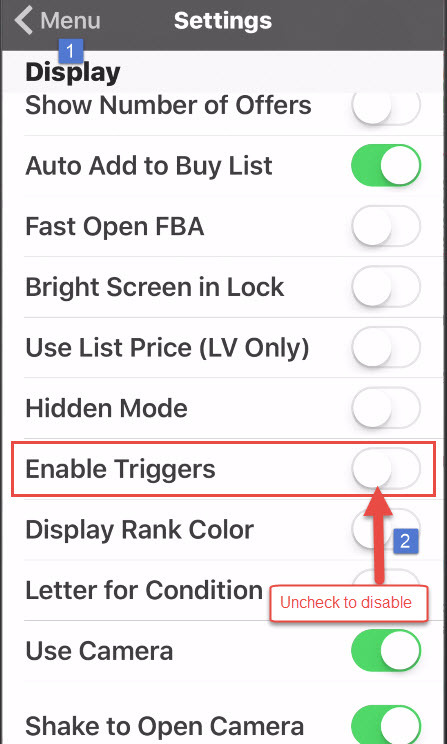 *Buy items list: Items signaled as ‘Buy’ by the triggers will automatically be added to the buy items list. For other items, you can tap this icon to add the item manually.